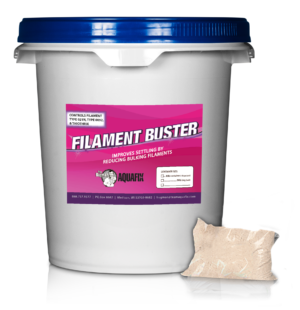 Filament Buster reduces the levels of bulking filaments Type 021N, Thiothrix and Type 0092. It is a specific source of amino acids and micronutrients. Typically, these filaments cause bulking in wastewater systems with nitrogen deficiency and lead to dewatering issues. They can be present on an ongoing basis, during times of seasonal temperature changes, or as a result of getting dumped on by upstream sources. This product is specifically designed to combat filaments caused by nitrogen deficiency. Use SmartBOD in systems with low F:M and high sludge age conditions. Filament Buster is added to the aeration basin of various types of activated sludge processes including: SBRs, oxidation ditches, extended aeration wastewater treatment plants, as well as MBBR and MBR treatment plants. In addition to municipal waste streams, it works great for balancing high sugars in the juice and beverage industries. Filament Buster works by providing floc forming bacteria the amino acids and micronutrients they need to out compete bulking filaments Type 021N, Thiothrix and Type 0092. Thiothrix/Type 021N are thought to be different forms of the same filament. Thiothrix tends to be more observed in low DO, septic and sulfur reducing conditions. Type 021N is more prevalent in nitrogen deficient conditions. Type 0092 can cause bulking problems in aerobic wastewater systems but is an important precursor to foaming caused by M. Parvicella. Type 0092 thrives in conditions with very similar food sources to M. Parvicella but in warmer weather conditions. Traditionally when wastewater plants have these filaments they may use a simple form of nitrogen, like urea. The nitrifying organisms and the floc forming bacteria are in competition for the ammonia in the form of urea. The amino acids and micronutrients in Filament Buster are metabolized more directly by floc forming bacteria, will limit exocellular polysaccharide sliming (EPS) and produce better settling. In industrial wastewater plants trying to balance BOD:N:P ratios where they get high BOD loadings in the form of a carbohydrates, Filament Buster creates less D.O. demand than traditional urea. In addition, by addressing the nitrogen deficiency in a fundamental way a plant will produce less sludge. This product functions best added daily to the first section of the aeration basin in an aerobic wastewater system. Filament Buster works well in combination with: Qwik-Zyme L, Qwik-Zyme P and OxyFresh depending on what waste stream it is being added to and what filament needs to be controlled.